What can I say? Jesus did it again! Today was another adventure. I love these days! We are currently at a ministry run by a German man by the name of Walter Heidenreich. He is the founder of "Help for all Nations". After breakfast we were taken to the Missions Ministry School that they have here. They train missionaries that will be sent out around the world. These people are not only being trained to do missions work but to also be servants of others. It was very encouraging for us to see. The topic of the today's meeting was prayer and evangelism. My dad was the first to speak. He spoke about sin as did Ryan. I spoke a little on prayer, evangelism and then sin. My dad gave an altar call and all of the 35 students came forward. After the altar call the power of the Lord really fell. The Lord is going to use these people. The presents of the Lord was there in such a tangible way. People were not able to remain standing because of the power of the Lord. Later, we met with Walter for coffee and pasteries. We talked with him for a some time about revival and the amazing things the Lord was doing at Brownsville and in Germany. Walter shared some of the great things the Lord was doing through his ministry around the world. 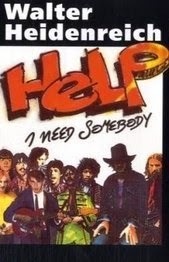 He gave each of us a signed copy of his book; "Help, I need somebody". Later in the evening we ministered at a youth meeting and spoke again spoke on sin and how it separates us from our creator. I had a hard time speaking because I could feel the Lord so close and I could not help but weep. As soon as I gave the altar call, the majority of the youth came to the front. Some knelt down and began to weep while others began to shake under the power of the Lord. The Spirit of the Lord was there in such power. We lead the youth in a prayer of commitment to the Lord. Many of the young people there had been backslidden and were coming back to the Lord again. Others had met the Lord for the first time. After the altar call we went around and prayed for each person. Most of them were so overcome with the Lord they could not remain on their feet. It was AWESOME!